Modern Style & Designer hand bracelet in white pearl with Adjustable Kadi for Modern Girls Jewellery Bracelet pretty look white pearl bracelet for stylish Girl Jewellery. Antique Design Bracelets For White Stone For artificial Jewellery,Copper base material for modern women jewellery. 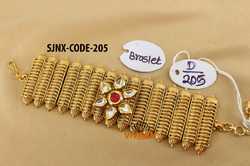 Antique Design & Gorgeous finishing Long Braslet with Stunning Pretty look for bridal Women jewellery. Traditional Look. Antique Design Bracelets For Red AD Stone For artificial Jewellery,Copper base material for modern women jewellery.